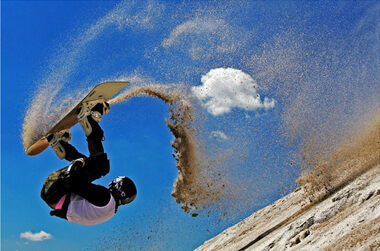 A man-made slag heap that you can "ski" down, and is home to the world sandboarding championships. Monte Kaolino is a 110 meter high man-made mountain consisting of roughly 35 million tons quartz sand. A varied collection of brains in alcohol. While Kaolinite has been mined in Hirschau, Bavaria, since 1833 it was in 1901 when Amberger Kaolinwerk began mining Kaolinite – one of the most common minerals, a clay-like layered silicate, used in ceramics, medicine, coated paper, food additives, in toothpaste, and is the main ingredient in porcelain – they found themselves with a problem. In the process of separating the Kaolinite from the dirt they ended up with a lot of left over quartz sand. So they started piling it up. By the early 1950s the pile had grown large enough that a skier wanting to practice in the summer, brought his poles to the mountain, and began doing skiing down the enormous pile. By 1956 there was a ski club dedicated to skiing down the quartz sand mountain. Today, although the mountain has stopped growing – it turns out quartz sand is good for a whole bunch of things – it continues to host skiers, the Monte Kaolino Railway a 200 meter long cable car with boat-shaped wagons, a “Dune Pool” including a 50 m - water slide, and 1,000 meter Alpine-Coaster that zooms riders down the giant slag heap. 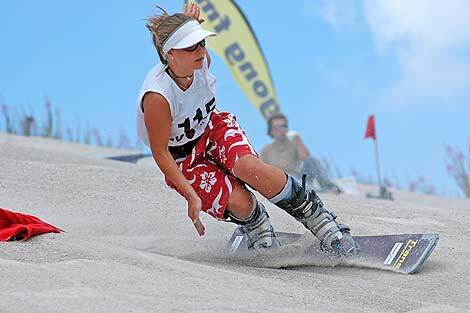 In addition to all this, Monte Kaolino is also home to the Sandboarding World Championships, in which many of the same types of winter boarding competitions are held, but on sand. Speeds of up to 60 mph have been clocked. Because it is one of the few warm skiing spots, one can even ski in their swimwear, should they choose to. This extremely narrow tenement boasts a maximum occupancy of just two. A tiny basalt mountain with an observation tower overlooking the beautiful Bavarian countryside. A preserved Nazi labor camp now has a Holocaust museum on site and memorials to the thousands that died while imprisoned at the camp. Money made from smuggling sugar helped create this wondrous rock maze in honor of the Prussian Queen Louise.